UPDATED: Sun., April 1, 2018, 1:43 p.m.
WASHINGTON – Former Veterans Affairs Secretary David Shulkin is making it clear he was fired from his job amid conflicting claims from the White House. White House spokeswoman Lindsay Walters on Sunday told the Associated Press that Shulkin had “resigned” from his job when President Donald Trump abruptly announced via Twitter last Wednesday that he was nominating White House doctor Ronny Jackson to replace him. But in television interviews, Shulkin said he had not submitted a resignation letter, or planned to, and was only told of Trump’s decision shortly before the Twitter announcement. 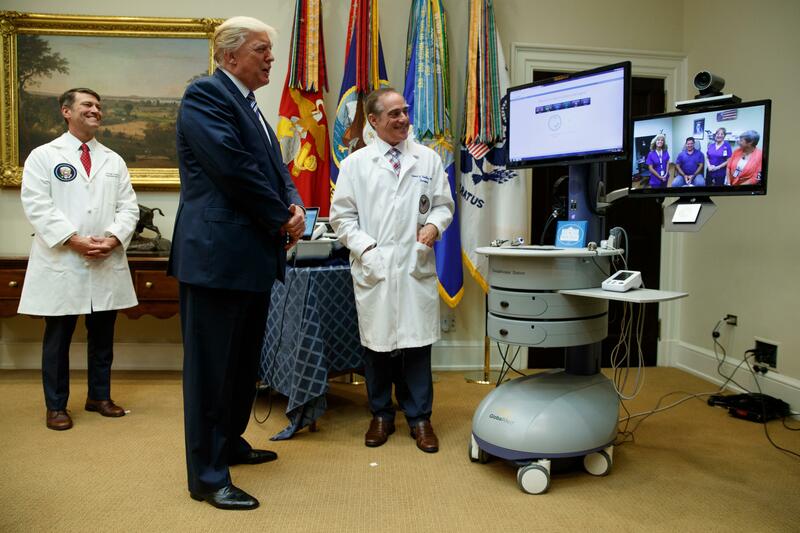 He said he had spoken to Trump by phone earlier that day about VA improvements, with no mention of his job status, and was scheduled to meet with the president the next morning. The semantics could be relevant to Trump’s ability to name an acting VA secretary to temporarily fill Shulkin’s place. Last week, Trump named Defense Department official Robert Wilkie to the acting position, bypassing Shulkin’s deputy secretary, Tom Bowman. Bowman has come under criticism for being too moderate to push Trump’s agenda. The day after announcing that he was replacing Shulkin, Trump told a rally in Richfield, Ohio, that he had been dissatisfied with efforts to improve VA. Shulkin had enjoyed Trump’s support for much of his first year in the administration, but that eroded in February after a bruising ethics scandal and political infighting at VA.
A VA spokesman did not have immediate comment Sunday. Wilkie, now listed on the VA website as acting secretary, took over Shulkin’s duties last week. The back and forth over the circumstances behind Shulkin’s departure – and what it could mean for Wilkie’s status – comes as the nomination of Jackson is drawing concern among lawmakers and veterans groups. They worry the Navy rear admiral and lifelong physician lacks the experience to manage an enormous agency paralyzed over Trump’s push to expand private care. On Sunday, Shulkin, who had previously recommended Jackson to be VA undersecretary of health, repeatedly demurred when asked to fully endorse Jackson for the job of VA secretary. He noted the complexity of running the government’s second largest department. Shulkin’s dismissal comes amid a broader shakeup of top Trump administration officials and charges of excessive spending by Cabinet officials. Also currently under fire are Environmental Protection Agency Administrator Scott Pruitt, Interior Secretary Ryan Zinke and Housing and Urban Development Secretary Ben Carson. The AP reported last week that Pruitt paid just $50 a night for about six months last year to stay in a Capitol Hill condominium linked to a prominent Washington lobbyist whose firm represents fossil fuel companies. On Sunday, former New Jersey Gov. Chris Christie, a Republican, and Sen. Doug Jones, D-Ala., questioned whether Pruitt would be able to last in his job. “I don’t know how you survive this one, and if he has to go, it’s because he never should’ve been there in the first place,” Christie said. “He’s in real trouble … I think it seems that he may be on his way out,” Jones said. Published: April 1, 2018, 8:21 a.m. Updated: April 1, 2018, 1:43 p.m.